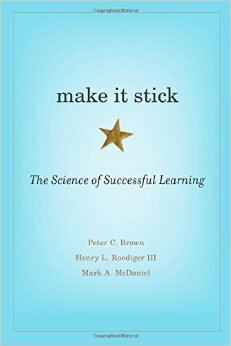 I have shelf upon shelf of books on learning but if I had to recommend just one book it would be Make It Stick by Brown, Roediger and McDaniel. It has one big weakness, and I’ll come to that later., but what makes it compelling is it’s its laser like focus on contemporary research on optimal methods of learning, while swatting pseudo-theories to one side. By far the most important message in the book comes at the start when they boldly claim that most good learning theory is counterintuitive. They set the scene by explaining why most students are misled by institutions into the wrong strategies for studying. Intuitively, reading, highlighting, underlining and rereading seems productive but the evidence suggests it is a largely hopeless strategy for learning. In fact, the evidence shows that we are very poor judges of our own learning. The optimal strategies for learning are in the 'doing' and some of that doing is counterintuitive. We kid ourselves into thinking we’re mastering something but this is an illusion of mastery. It’s easy to think you’re learning when the going is easy – re-reading, underlining, repetition…. but it doesn’t work. To learn effectively, you must make the going harder and employ a few counterintuitive tricks along the way. They neatly explain why the research is NOT about rote learning, the charge that is usually levelled against them - just to head that one off at the pass. This is the premise – effortful learning. It’s what most of the people I admire in the learning world have been saying for years – Schank, Downes and most academic, cognitive scientists. By effort they mostly mean retrieval practice This is the one strategy they hammer home. Use your own brain to retrieve, or do, what you think you know. Flashcard questions, simple quizzes (not multiple-choice) anything to exercise the brain through active recall, not only reinforces what you know (and so easily forget) but may even be even stronger, in terms of subsequent retention and recall, than the original exposure. That’s a killer finding. Recall is more powerful than teaching. Practically, they recommend regular, low-stakes testing for teachers and learners. And before you get all tetchy about ‘teaching to the test’, they don’t mean summative assessment but regular formative exercises, where recall is stimulated and encouraged. The evidence here is pretty overwhelming. Test little and often – that’s what makes effortful learning stick. To repeat - they don’t mean testing as assessment, they mean learning. Interesting research is also presented for the idea that having a go, even when you make mistakes and errors, is better than simply getting the exposition. The active learning seems to have a powerful effect on retention and recall. I’ve been banging on about this for decades but they nail the research, namely its efficacy, and the fact that it is NOT mere repetition. All of that Bjork stuff on ‘Deliberate difficulties’ is also in here. Rather than doing a homogeneous set of learning or retrieval tasks, try interleaving them. The evidence suggests that this makes gives you higher retention and you are much more adaptable when it comes to solving new problems in the future. An interesting one this. Apparently, instantaneous feedback can be less productive than delayed feedback. I’ve used this recently and have to agree that I see the point. The book cleverly employs the methods they recommend in its structure but it has one big weakness - the third author. Whereas I had heard of Roediger and McDaniel as well published academics, I had never heard of Peter Brown. It looks as though the publisher has made them hire a novelist to bring their research to life. Brown introduces each chapter with overwritten stories to illustrate the research but I found them wearisome. Interestingly, none of their research supports this approach to learning and stories and storytelling don’t even appear in the index. Read them if you want - I just skipped them. The book gives a brilliant update on recent research in cognitive science on how we learn. (You don’t see Vygotsky in the index of this book, thank God.) It's the result of over ten years of focused research on 'Applying Cognitive Psychology to Enhance Educational Practice'. It’s practical and gives plenty of advice on both how to teach and how to learn, the point being that knowing how to learn is a necessary condition for good teaching. Hi Donald. My copy arrived today- and I was amused to read in the second paragraph of the preface that "Peter Brown is a storyteller". I'd only just read your previous post last night and agreed with you! I'm sure it wont spoil my enjoyment.